Last week we earned a HUGE honor….the kind folks at The San Diego Ad Club named us the Industry Affiliate of the Year at their Brand Diego Excellence Awards. Lucky us!!! We have been recognized for our ongoing commitment to the San Diego business community and in support of the advertising and marketing industry in our region. 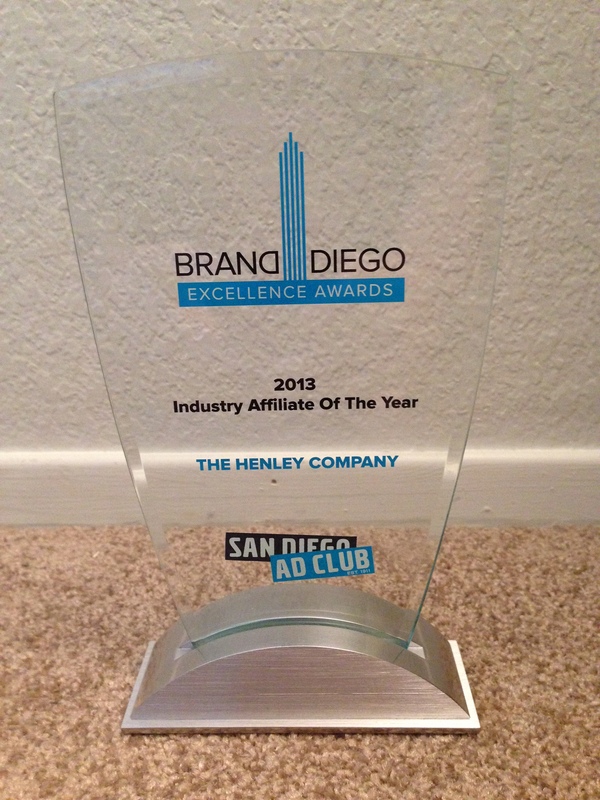 For more information about the awards, visit the Brand Diego website: http://www.sandiegoadclub.com/brand-diegos. Congrats to all of the other nominees – what an awesome group of San Diego professionals! Thank you SAN DIEGO AD CLUB! You have made more than just our day, week or month! You have reminded us how much we LOVE what we do every day! Our beautiful award has found a happy home at the Henley Headquarters! Enjoying a round-the-world trip is the ultimate RECESS! What would be top of your list of places to visit? How to plan a round-the-world trip – CNN.com. We are ready to help your dream come true! Book your next vacation today!! This Summer it seems like everyone is heading to Alaska for their family vacation. I personally know 6 families that have headed North. With the dollar so weak internationally and the negative press (unfortunately) Mexico receives, it seems like Alaska has become the vacation darling in the past 12-months. At the end of June, my parents and I took a 7-day cruise through Alaska, starting in Anchorage / Seward and ending in Vancouver, Canada. I was prepared for the luxuries of the cruise ship – first-class entertainment, unlimited dining options, friendly service and the opportunity to meet new friends. What I was not prepared for, which Alaska more than delivered, was the majestic beauty and jaw-dropping gifts Mother Earth has given us in that part of the world. Alaska’s landscape, in a word, is stunning! I admit I’m a bit more a city dweller than a real rough and tough nature girl. I can appreciate nature and what beauty it offers but I don’t really find myself needing to become “one with nature”. I prefer to become “one” with urban landscapes and the hustle and bustle of city life. It’s almost as if Alaska scoffed at my pre-conceived notion that nature is only pretty to look at but it doesn’t feed my soul the way European cafes, shopping bazaars and the metro station does. Upon arrival, I think Alaska made note that another one of the “lower 48’s” had arrived and it was challenged again to change yet another mind about the significance of lush landscape, vast terrain and wondrous wildlife. The natives are quick to tell you that in spite of what Sara Palin says (via Tina Fey’s impersonation on SNL) they cannot see Russia from their porches. However, they are very committed to making sure you know that Alaska is a place they are very proud to call home. I think the reason they can’t see Russia is because Alaska is one frigg’n big state! Alaska really has 2 seasons – Summer (when everyone works 7-days a week and 14 hour days) and the rest of the year. Those that stay beyond the summer season have to navigate the brutality of below freezing temperatures, frozen pipes, and sustaining themselves financially on whatever they made during the “high season.” Imagine only working 4-months out of the year and then basically being forced to hibernate the other 8 months. Although at first glance this seems like a vacation, the truth is living in Alaska is not for the faint of heart. Although they work their hands to the bone in the summer and hope for a survivable winter, true Alaskans would not want it any other way. It’s obvious that Alaska is a way of life. From the comfort of our luxurious cruise ship, we saw Alaska the easy way. Our ports of call included Seward, Haines / Skagway, Juneau and Ketchikan. Seaward offered us the chance to enjoy a great tour which included dog sled racing at the world-famous Seavey Family Homestead (The Seavey’s are the most prolific Ididarod racing family) and getting face to face with Exit Glacier in Kenai National Park. From cuddling husky puppies to seeing the vast glacial ice wall, Seward was a highlight of our trip. From Seward, we spent two days at sea, which took us to Glacier Bay. To be a stone’s throw from a glacier and to listen to the explosion as the ice falls into the sea is unforgettable. What I will remember about Glacier Bay are the sounds – crashing ice, the squawk of sea birds and the howling of the wind – Glacier Bay is nature’s soundtrack. You are truly at the alter of Mother Nature and you pay reverence by being quiet and still and just taking in the majesty that surrounds you. Our first port was Haines / Skagway. Haines is a very tiny town made famous in the gold rush era. After exploring Haines (which takes about as long as drinking a cup of coffee), we took the ferry across the bay to Skagway. With a more active Main Street, Skagway offers more in terms of restaurants, shops and jewelry stores (you’ve rarely seen the number of jewelry stores that Alaska offers). Our second port was Juneau – the capital of Alaska. Did you know there are no roads to drive to Juneau? It’s the only capital that you have to either get to by boat or float plane. Juneau offered us the chance to go whale watching. Within 10 minutes of leaving the dock, our Captain informed us that we had a pod of orca just off the bow. For nearly 45 minutes, we watched as 6 orca frolicked and hunted for lunch. We even had an up close encounter when a baby orca even skimmed the side of our boat. The trip also included humpback whale sightings, sea lions and bald eagles flying over head. Juneau also has Mt. Roberts Tram, which offers one of the most amazing views of Alaska. Within 7 minutes, you are transported 3800 feet from the seafront to the mountain tops. We were given the gift of perfect weather that day which made the view even more spectacular. Our last port was Ketichikan, which is known for the world’s largest rain gauge. That should tell you how much rain they receive each year! Our day in Ketichikan included a local tour and a visit to the Saxman Native Village, which offers insight into the history and cultural significance of totem poles. Our voyage to Vancouver took us through the Inside Passage, a beautiful route that skims tiny islands and provides the opportunity to see marine wildlife. The natives say that Alaska gets into your soul. After 10-days in the great state, I would have to agree. It literally feels like you are in another world – and not just because you are a long way from home. Alaska is pristine; it’s crisp, it’s pure and it’s life-changing. I found myself in moments of devout gratitude that I was experiencing nature in such a profound way. Do yourself a favor and put Alaska on your bucket list. If for no other reason than to allow Mother Nature to cleanse your mind and soul! Here are a few special moments from our trip….